Yes, this has absolutely nothing to do with Thanksgiving. It just happened to fall on this week. This is my 150th post. Yahoo. So I'm having a little giveaway. 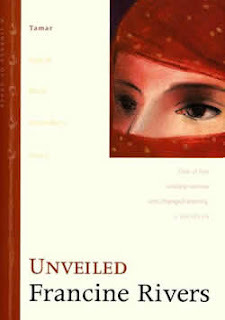 This is for the book "Unveiled," by (yet again) Francine Rivers. This is the first in a series, true stories about women from the Bible. "One of five women who changed eternity." It's a novella, you can seriously read it in a day, which you may once. But you will revisit it, because it is just that good. Tamar, for those who don't know, is the first woman listed in the genealogy of Jesus. She was not a Hebrew, but married into a Hebrew family. Time after time, the men in that family abuse her, use her and mistreat her, and in the end, she has to take a stand against the head of the family for herself and, ultimately, for the future. Now, of course, it's talking about a different culture than our own, so some of the practices and laws sound strange to us. What I love about this story is that it shows how, even when our lives seem totally screwed up, whether by our own actions or by other people's actions, God can take it and make it beautiful and make it significant. Tamar is the first woman (out of only 5) listed in Jesus' genealogy. This story tells us why. As a side note, I am very cautious about Christian fiction. So often, it seems like authors will take Christian themes or a "Christian" story and give a representation of God, Christ and Christianity that bears no resemblance to Scripture. This is not one of those stories. From my own study and research, this is an accurate retelling of the facts of the story, and Rivers has infused emotions and motivations that are consistent with Scripture. And because it's Francine Rivers, it will be sure to stay with you for a long time, and make you think about things differently. Since I will be gone next weekend, I'm going to start this giveaway today and officially end it on midnight, December 8th. So have at it, bloggy buddies! I promise, you want this one. My favorite historical fiction is the Outlander series by Diana Gabaldon. I can't pick one. I love historical fiction. Does a specific area or time period count? I love anything Civil War era. And I read several Orphan Train novels based on journals several years ago. And I am already a follower! I will do a post about your giveaway in the next couple of days. In the meantime(shameless self-promotion here) check out my giveaway for my 100th post! I read all five of these books in college and LOVED them! I've always wanted to read more of her stuff, but haven't got around to it. As for your question on my blog. We can't do Christmas decorations this year :( We're PCSing/ going home to Ohio, so it's just not going to happen. I'm going all out next year though! Have a good Thanksgiving! Favorite Novel - first book to the "Mark of the Lion Series" by Francine rivers. Does Gone With the Wind count?! That is one of my absolute favorite books. But I love anything based in the Civil War era...fiction or nonfiction. Does the Left Behind Series count? That's my fav if it does.. I got deep into those books. And you know I'm a follower! The Red Tent by Anita Diamant- I think it is technically fiction but it is about how life was in the Bible times for women, and that part was very accurate. It was such a good book that made me think very differently about the women back then! I'm already a follower, but I've been slacking due to traveling. Don't worry though, I'm back and I'll be better at reading! Hey, I'm a follower now! I love anything Civil War era. I will post on my blog in a few days.....!